The Cragar S/S wheel was first introduced in 1964. 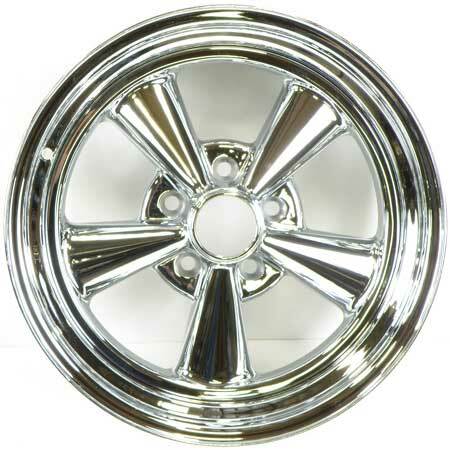 By 1974 the Cragar S/S had become one of the most popular wheels of the muscle car era. This wheel is now back in vogue with muscle car enthusiasts who prefer a custom look, but wish to keep their car "period correct". Because it was chrome plated rather than polished aluminum, it held its shine and was easier to keep clean. Instead of requiring time consuming polishing, the Cragar S/S was ready to show with a simple hosing off and wiping down. Sold individually. Chrome aluminum center cap is included. Lug nuts sold separately. Specifications: Wheel size: 14" x 7" Bolt pattern: 5 x 4-1/2", 5 x 4-3/4" and 5 x 5" triple bolt pattern Backspacing: 4-1/8" Offset: +3mm Note: Shipped overweight. Click here to learn how to measure Wheel Backspacing, Wheel Offset or Bolt Pattern. The Cragar S/S wheel was first introduced in 1964. 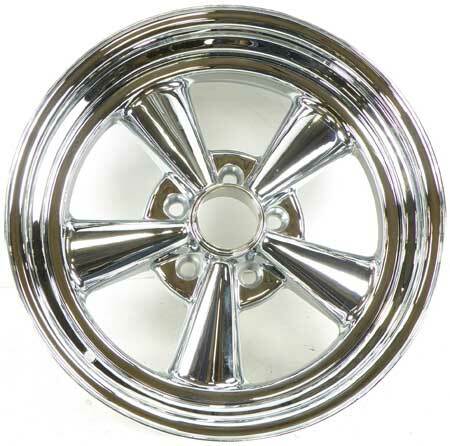 By 1974 the Cragar S/S had become one of the most popular wheels of the muscle car era. This wheel is now back in vogue with muscle car enthusiasts who prefer a custom look, but wish to keep their car" period correct". Because it was chrome plated rather than polished aluminum, it held its shine and was easier to keep clean. Instead of requiring time consuming polishing, the Cragar S/S was ready to show with a simple hosing off and wiping down . Chrome aluminum center cap is included. Lug nuts sold separately. Specifications: Wheel size: 17" x 9" Bolt pattern: 5 x 4-3/4" Backspacing: 4-1/2" Offset: -12mm Click here to learn how to measure Wheel Backspacing, Wheel Offset or Bolt Pattern. Note: Sold individually. Shipped overweight . The Cragar S/S wheel was first introduced in 1964. By 1974 the Cragar S/S had become one of the most popular wheels of the muscle car era. This wheel is now back in vogue with muscle car enthusiasts who prefer a custom look, but wish to keep their car" period correct". Because it was chrome plated rather than polished aluminum, it held its shine and was easier to keep clean. Instead of requiring time consuming polishing, the Cragar S/S was ready to show with a simple hosing off and wiping down . Chrome aluminum center cap is included. Lug nuts sold separately. Specifications: Wheel size: 17" x 8" Bolt pattern: 5 x 4-3/4" Backspacing: 4-1/2" Offset: 0mm Click here to learn how to measure Wheel Backspacing, Wheel Offset or Bolt Pattern. Note: Sold individually. Shipped overweight. The ultimate nostalgic wheel, the chrome smoothie provides a look like no other. It is often used with whitewalls and baby moons. A chrome moon center cap is included with each wheel, but with a little ingenuity, this wheel can provide many different l ooks for your vehicle. Lug nuts sold separately. Sold individually. Specifications: Wheel size: 15" x 6" Bolt pattern: 5 x 4-1/2" and 5 x 4-3/4" * Backspacing: 3-3/ 4" Offset: +7mm * This is a dual bolt pattern wheel to accomodate two different bolt patterns meaning it is a universal fit wheel with 10 bolt holes. Click here to learn how to measure Wheel Backspacing, Wheel Offset or Bolt Pattern. Note: Shipped overweight. The style of the Cragar Street Pro is reminiscent of the Halibrand Sprint which was made famous on the circle track cars of the 60's. The similarities stop there, however. Unlike the Halibrand which was made of magnesium and required constant polishing to retain its shine, the Cragar Street Pro is a chrome plated steel rim with a chrome plated aluminum center. It cleans up easily and retains its shine with a simple hosing off and wiping down. The price of original 60's era Halib rands has been pushed up by collectors and the new Halibrand wheels are also very pricey. So, if you'd like the look of a legend at about 1/4 of the price, the Cragar Street Pro 390 is definitely the way to go. A chrome aluminum spinner style ce nter cap is included with each wheel. Lug nuts sold separately. Note: Sold individually. Shipped overweight. Specifications: Wheel size: 15" x 7" Bolt pattern: 5 x 4-1/2" and 5 x 4-3/4" * Backspacing:3-1/2" Offset: -12mm * This is a dual bolt pattern wheel to accomodate two different bolt patterns meaning it is a universal fit wheel with 10 bolt holes. Click here to learn how to measure Wheel Backspacing, Wheel Offset or Bolt Pattern. The ultimate nostalgic wheel, the chrome smoothie provides a look like no other. It is often used with whitewalls and baby moons. 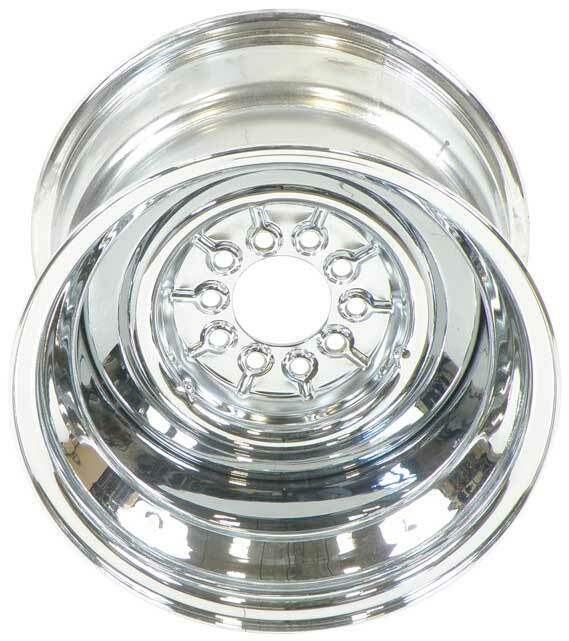 A chrome moon center cap is included with each wheel, but with a little ingenuity, this wheel can provide many different looks for your vehicle. Lug nuts sold separately. Sold individually. 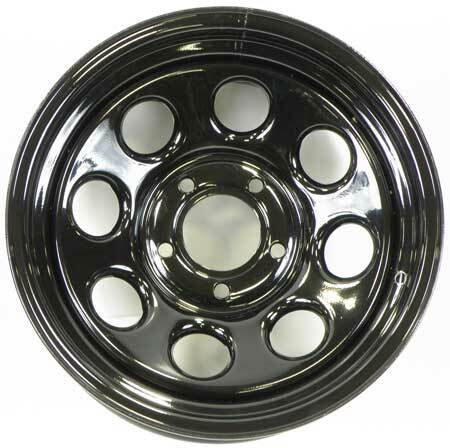 Specifications: Wheel size: 14" x 7" Bolt pattern: 5 x 4-1/2" and 5 x 4-3/4" * Backspacing: 4" Offset: 0mm * This is a dual bolt pattern wheel to accomodate two different bolt patterns meaning it is a universal fit wheel with 10 bolt holes. Click here to learn how to measure Wheel Backspacing, Wheel Offset or Bolt Pattern. Note: Shipped overweight. The Cragar S/S wheel was first introduced in 1964. By 1974 the Cragar S/S had become one of the most popular wheels of the muscle car era. This wheel is now back in vogue with muscle car enthusiasts who prefer a custom look, but wish to keep their car "period correct". Because it was chrome plated rather than polished aluminum, it held its shine and was easier to keep clean. Instead of requiring time consuming polishing, the Cragar S/S was ready to show with a simple hosing off and wiping down. Sold individually. Chrome aluminum center cap is included. Lug nuts sold separately. Specifications: Wheel size: 14" x 6" Bolt pattern: 5 x 4-1/2", 5 x 4-3/4" and 5 x 5" triple bolt pattern Backspacing: 3-3/8" Offset: -3mm Note: Shipped overweight. Click here to learn how to measure Wheel Backspacing, Wheel Offset or Bolt Pattern. The ultimate nostalgic wheel, the chrome smoothie provides a look like no other. It is often used with whitewalls and baby moons. A chrome moon center cap is included with each wheel, but with a little ingenuity, this wheel can provide many different l ooks for your vehicle. Lug nuts sold separately. Sold individually. Specifications: Wheel size: 15" x 7" Bolt pattern: 5 x 4-1/2" and 5 x 4-3/4" * Backspacing: 4-1/ 8" Offset: +3mm * This is a dual bolt pattern wheel to accomodate two different bolt patterns meaning it is a universal fit wheel with 10 bolt holes. Click here to learn how to measure Wheel Backspacing, Wheel Offset or Bolt Pattern. Note: Shipped overweight. If your classic is a 1950-70's model, chances are it came with narrow wheels and tiny bias ply tires. By the mid 1960's, aftermarket wheel swaps were commonplace among car enthusiasts. 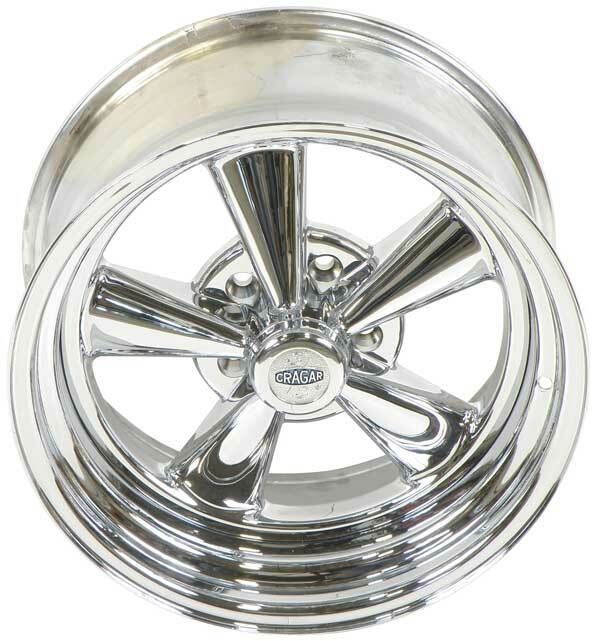 One of the most widely chosen aftermarket wheels available during the muscle car era was the Cragar Keystone Klassic. Popular for its composite design, the chrome plating made it much easier to clean than aluminum or mag wheels because it required no polishing. Cleaning was a breeze by just hosing it down and wiping it off. This wheel is now back in vogue with restoration enthusiasts who prefer a custom look, but wish to keep their classic "period correct". Sold individually. Chrome aluminum center cap included. Lug nuts sold separately. Specifications: Wheel size: 15" x 7" Bolt pattern: 5 x 4-1/2", 5 x 4-3/4" and 5 x 5" triple bolt pattern Backspacing: 3-3/4" Offset: -6mm Note: Shipped overweight. Click here to learn how to measure Wheel Backspacing, Wheel Offset or Bolt Pattern. The ultimate nostalgic wheel, the chrome smoothie provides a look like no other. It is often used with whitewalls and baby moons. A chrome moon center cap is included with each wheel, but with a little ingenuity, this wheel can provide many different l ooks for your vehicle. Lug nuts sold separately. Sold individually. Specifications: Wheel size: 14" x 6" Bolt pattern: 5 x 4-1/2" and 5 x 4-3/4" * Backspacing: 3-3/ 4" Offset: +7mm * This is a dual bolt pattern wheel to accomodate two different bolt patterns meaning it is a universal fit wheel with 10 bolt holes. Click here to learn how to measure Wheel Backspacing, Wheel Offset or Bolt Pattern. Note: Shipped overweight. The Cragar S/S wheel was first introduced in 1964. 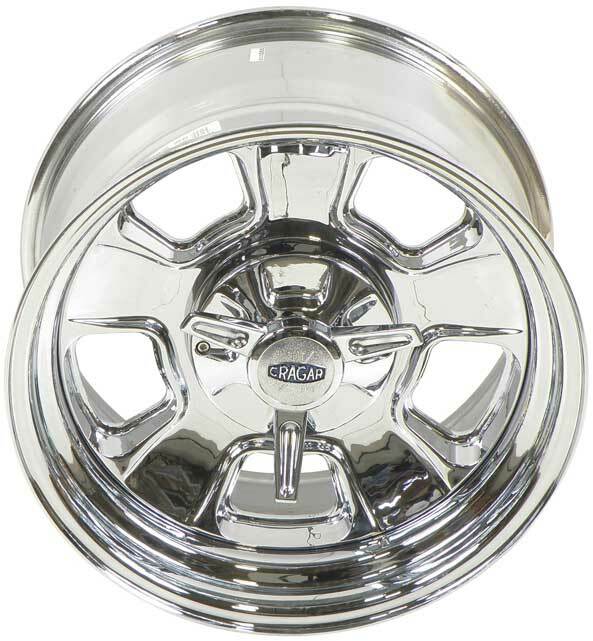 By 1974 the Cragar S/S had become one of the most popular wheels of the muscle car era. This wheel is now back in vogue with muscle car enthusiasts who prefer a custom look, but wish to keep their car "period correct". Because it was chrome plated rather than polished aluminum, it held its shine and was easier to keep clean. Instead of requiring time consuming polishing, the Cragar S/S was ready to show with a simple hosing off and wiping down. Sold individually. Chrome aluminum center cap is included. Lug nuts sold separately. Specifications: Wheel size: 15" x 6" Bolt pattern: 5 x 4-1/2", 5 x 4-3/4" and 5 x 5" triple bolt pattern Offset: +3mm Note: Shipped overweight. Click here to learn how to measure Wheel Backspacing, Wheel Offset or Bolt Pattern. The Cragar S/S wheel was first introduced in 1964. 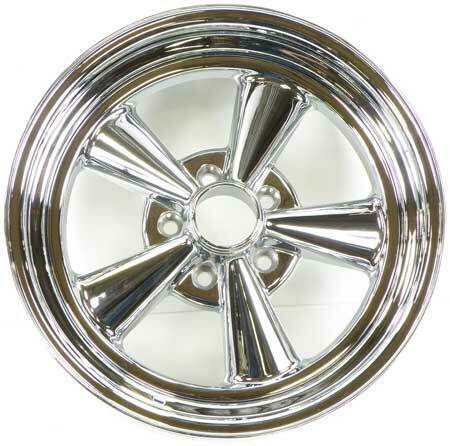 By 1974 the Cragar S/S had become one of the most popular wheels of the muscle car era. This wheel is now back in vogue with muscle car enthusiasts who prefer a custom look, but wish to keep their car" period correct". Because it was chrome plated rather than polished aluminum, it held its shine and was easier to keep clean. Instead of requiring time consuming polishing, the Cragar S/S was ready to show with a simple hosing off and wiping down . Chrome aluminum center cap is included. Lug nuts sold separately. Specifications: Wheel size: 17" x 9" Bolt pattern: 5 x 4-3/4" Backspacing: 5-1/2" Offset: 12mm Click here to learn how to measure Wheel Backspacing, Wheel Offset or Bolt Pattern. Note: Sold individually. Shipped overweight. The Cragar S/S wheel was first introduced in 1964. By 1974 the Cragar S/S had become one of the most popular wheels of the muscle car era. This wheel is now back in vogue with muscle car enthusiasts who prefer a custom look, but wish to keep their car "period correct". Because it was chrome plated rather than polished aluminum, it held its shine and was easier to keep clean. Instead of requiring time consuming polishing, the Cragar S/S was ready to show with a simple hosing off and wiping down. Sold individually. Chrome aluminum center cap is included. Lug nuts sold separately. Specifications: Wheel size: 15" x 10" Bolt pattern: 5 x 4-1/2", 5 x 4-3/4" and 5 x 5" triple bolt pattern Backspacing: 4-1/4" Offset: -32mm Note: Shipped overweight. Click here to learn how to measure Wheel Backspacing, Wheel Offset or Bolt Pattern. The style of the Cragar Street Pro is reminiscent of the Halibrand Sprint which was made famous on the circle track cars of the 60's. The similarities stop there, however. Unlike the Halibrand which was made of magnesium and required constant polishing to retain its shine, the Cragar Street Pro is a chrome plated steel rim with a chrome plated aluminum center. It cleans up easily and retains its shine with a simple hosing off and wiping down. The price of original 60's era Halib rands has been pushed up by collectors and the new Halibrand wheels are also very pricey. So, if you'd like the look of a legend at about 1/4 of the price, the Cragar Street Pro 390 is definitely the way to go. A chrome aluminum spinner style ce nter cap is included with each wheel. Lug nuts sold separately. Note: Sold individually. Shipped overweight. Specifications: Wheel size: 15" x 6" Bolt pattern: 5 x 4-1/2" and 5 x 4-3/4" * Backspacing:2-5/8" Offset: -28mm * This is a dual bolt pattern wheel to accomodate two different bolt patterns meaning it is a universal fit wheel wi th 10 bolt holes. Click here to learn how to measure Wheel Backspacing, Wheel Offset or Bolt Pattern. 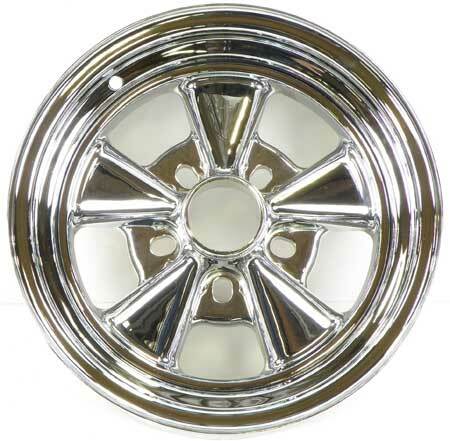 The Cragar S/S wheel was first introduced in 1964. By 1974 the Cragar S/S had become one of the most popular wheels of the muscle car era. This wheel is now back in vogue with muscle car enthusiasts who prefer a custom look, but wish to keep their car "period correct". Because it was chrome plated rather than polished aluminum, it held its shine and was easier to keep clean. Instead of requiring time consuming polishing, the Cragar S/S was ready to show with a simple hosing off and wiping down. Sold individually. Chrome aluminum center cap is included. Lug nuts sold separately. Specifications: Wheel size: 15" x 8" Bolt pattern: 5 x 4-1/2", 5 x 4-3/4" and 5 x 5" triple bolt pattern Backspacing: 4-1/4" Offset: -6mm Note: Shipped overweight. Click here to learn how to measure Wheel Backspacing, Wheel Offset or Bolt Pattern. The ultimate nostalgic wheel, the chrome smoothie provides a look like no other. It is often used with whitewalls and baby moons. A chrome moon center cap is included with each wheel, but with a little ingenuity, this wheel can provide many different l ooks for your vehicle. Lug nuts sold separately. Sold individually. Specifications: Wheel size: 15" x 10" Bolt pattern: 5 x 4-1/2" and 5 x 4-3/4" * Backspacing: 4-1 /4" Offset: -38mm * This is a dual bolt pattern wheel to accomodate two different bolt patterns meaning it is a universal fit wheel with 10 bolt holes. Click here to learn how to measure Wheel Backspacing, Wheel Offset or Bolt Pattern. Note: Shipped overweight. The style of the Cragar Street Pro is reminiscent of the Halibrand Sprint which was made famous on the circle track cars of the 60's. The similarities stop there, however. 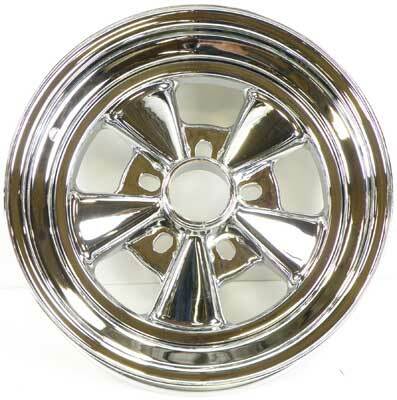 Unlike the Halibrand which was made of magnesium and required constant polishing to retain its shine, the Cragar Street Pro is a chrome plated steel rim with a chrome plated aluminum center. It cleans up easily and retains its shine with a simple hosing off and wiping down. The price of original 60's era Halib rands has been pushed up by collectors and the new Halibrand wheels are also very pricey. So, if you'd like the look of a legend at about 1/4 of the price, the Cragar Street Pro 390 is definitely the way to go. A chrome aluminum spinner style ce nter cap is included with each wheel. Lug nuts sold separately. Note: Sold individually. Shipped overweight. Specifications: Wheel size: 15" x 10" Bolt pattern: 5 x 4-1/2" and 5 x 4-3/4" * Backspacing: 4-1/4" Offset: -32mm * This is a dual bolt pattern wheel to accomodate two different bolt patterns meaning it is a universal fit wheel wi th 10 bolt holes. Click here to learn how to measure Wheel Backspacing, Wheel Offset or Bolt Pattern. The style of the Cragar Street Pro is reminiscent of the Halibrand Sprint which was made famous on the circle track cars of the 60's. The similarities stop there, however. Unlike the Halibrand which was made of magnesium and required constant polishing to retain its shine, the Cragar Street Pro is a chrome plated steel rim with a chrome plated aluminum center. It cleans up easily and retains its shine with a simple hosing off and wiping down. The price of original 60's era Halib rands has been pushed up by collectors and the new Halibrand wheels are also very pricey. So, if you'd like the look of a legend at about 1/4 of the price, the Cragar Street Pro 390 is definitely the way to go. A chrome aluminum spinner style ce nter cap is included with each wheel. Lug nuts sold separately. Sold individually. Specifications: Wheel size: 17" x 9" Bolt pattern: 5 x 4-1/2" and 5 x 4-3/4" * Backspacing:5 -1/4" Offset: +6mm * This is a dual bolt pattern wheel to accomodate two different bolt patterns meaning it is a universal fit wheel with 10 bolt holes. Click here to learn how to measure Wheel Backspacing, Wheel Offset or Bolt Pattern. Note: Shipped overweight. The Cragar S/S wheel was first introduced in 1964. 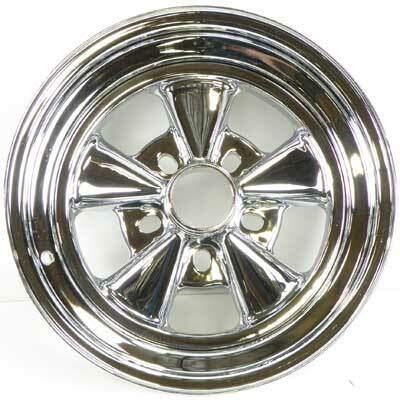 By 1974 the Cragar S/S had become one of the most popular wheels of the muscle car era. This wheel is now back in vogue with muscle car enthusiasts who prefer a custom look, but wish to keep their car" period correct". Because it was chrome plated rather than polished aluminum, it held its shine and was easier to keep clean. Instead of requiring time consuming polishing, the Cragar S/S was ready to show with a simple hosing off and wiping down . Chrome aluminum center cap is included. Lug nuts sold separately. Specifications: Wheel size: 17" x 7" Bolt pattern: 5 x 4-3/4" Backspacing: 3-1/2" Offset: -12mm Click here to learn how to measure Wheel Backspacing, Wheel Offset or Bolt Pattern. Note: Sold individually. Shipped overweight. The style of the Cragar Street Pro is reminiscent of the Halibrand Sprint which was made famous on the circle track cars of the 60's. The similarities stop there, however. Unlike the Halibrand which was made of magnesium and required constant polishing to retain its shine, the Cragar Street Pro is a chrome plated steel rim with a chrome plated aluminum center. It cleans up easily and retains its shine with a simple hosing off and wiping down. The price of original 60's era Halib rands has been pushed up by collectors and the new Halibrand wheels are also very pricey. So, if you'd like the look of a legend at about 1/4 of the price, the Cragar Street Pro 390 is definitely the way to go. A chrome aluminum spinner style ce nter cap is included with each wheel. Lug nuts sold separately. Note: Sold individually. Shipped overweight. Specifications: Wheel size: 15" x 8" Bolt pattern: 5 x 4-1/2" and 5 x 4-3/4" * Backspacing:4-1/4" Offset: -6mm * This is a dual bolt pattern wheel to accomodate two different bolt patterns meaning it is a universal fit wheel with 10 bolt holes. Click here to learn how to measure Wheel Backspacing, Wheel Offset or Bolt Pattern. The Cragar S/S wheel was first introduced in 1964. 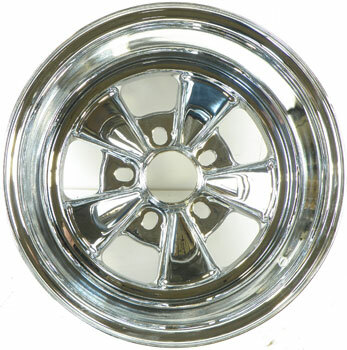 By 1974 the Cragar S/S had become one of the most popular wheels of the muscle car era. This wheel is now back in vogue with muscle car enthusiasts who prefer a custom look, but wish to keep their car "period correct". Because it was chrome plated rather than polished aluminum, it held its shine and was easier to keep clean. Instead of requiring time consuming polishing, the Cragar S/S was ready to show with a simple hosing off and wiping down. Sold individually. Chrome aluminum center cap is included. Lug nuts sold separately. Specifications: Wheel size: 15" x 7" Bolt pattern: 5 x 4-1/2", 5 x 4-3/4" and 5 x 5" triple bolt pattern Backspacing: 4-1/8" Offset: +3mm Note: Shipped overweight. Click here to learn how to measure Wheel Backspacing, Wheel Offset or Bolt Pattern. The ultimate nostalgic wheel, the chrome smoothie provides a look like no other. It is often used with whitewalls and baby moons. A chrome moon center cap is included with each wheel, but with a little ingenuity, this wheel can provide many different l ooks for your vehicle. Lug nuts sold separately. Sold individually. Specifications: Wheel size: 15" x 8" Bolt pattern: 5 x 4-1/2" and 5 x 4-3/4" * Backspacing: 4-1/ 4" Offset: -15mm * This is a dual bolt pattern wheel to accomodate two different bolt patterns meaning it is a universal fit wheel with 10 bolt holes. Click here to learn how to measure Wheel Backspacing, Wheel Offset or Bolt Pattern. Note: Shipped overweight. The Cragar S/S wheel was first introduced in 1964. By 1974 the Cragar S/S had become one of the most popular wheels of the muscle car era. This wheel is now back in vogue with muscle car enthusiasts who prefer a custom look, but wish to keep their car" period correct". Because it was chrome plated rather than polished aluminum, it held its shine and was easier to keep clean. Instead of requiring time consuming polishing, the Cragar S/S was ready to show with a simple hosing off and wiping down . Chrome aluminum center cap is included. Lug nuts sold separately. Specifications: Wheel size: 17" x 8" Bolt pattern: 5 x 4-3/4" Backspacing: 3-1/2" Offset: -25mm Click here to learn how to measure Wheel Backspacing, Wheel Offset or Bolt Pattern. Note: Sold individually. Shipped overweight. The style of the Cragar Street Pro is reminiscent of the Halibrand Sprint which was made famous on the circle track cars of the 60's. The similarities stop there, however. Unlike the Halibrand which was made of magnesium and required constant polishing to retain its shine, the Cragar Street Pro is a chrome plated steel rim with a chrome plated aluminum center. It cleans up easily and retains its shine with a simple hosing off and wiping down. The price of original 60's era Halib rands has been pushed up by collectors and the new Halibrand wheels are also very pricey. So, if you'd like the look of a legend at about 1/4 of the price, the Cragar Street Pro 390 is definitely the way to go. 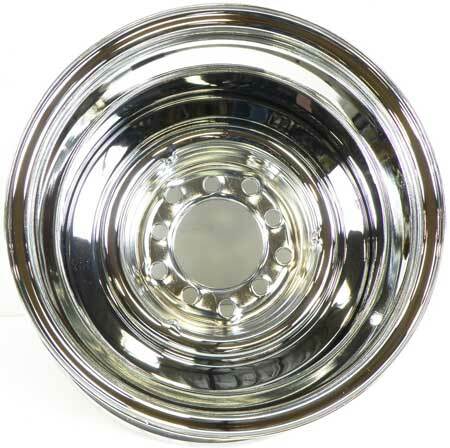 A chrome aluminum spinner style ce nter cap is included with each wheel. Lug nuts sold separately. Sold individually. Specifications: Wheel size: 17" x 9" Bolt pattern: 5 x 4-1/2" and 5 x 4-3/4" * Backspacing:4 -1/2" Offset: -12mm * This is a dual bolt pattern wheel to accomodate two different bolt patterns meaning it is a universal fit wheel with 10 bolt holes. Click here to learn how to measure Wheel Backspacing, Wheel Offset or Bolt Pattern. Note: Shipped overweight. The style of the Cragar Street Pro is reminiscent of the Halibrand Sprint which was made famous on the circle track cars of the 60's. The similarities stop there, however. Unlike the Halibrand which was made of magnesium and required constant polishing to retain its shine, the Cragar Street Pro is a chrome plated steel rim with a chrome plated aluminum center. It cleans up easily and retains its shine with a simple hosing off and wiping down. The price of original 60's era Halib rands has been pushed up by collectors and the new Halibrand wheels are also very pricey. So, if you'd like the look of a legend at about 1/4 of the price, the Cragar Street Pro 390 is definitely the way to go. A chrome aluminum spinner style ce nter cap is included with each wheel. Lug nuts sold separately. Sold individually. Specifications: Wheel size: 17" x 8" Bolt pattern: 5 x 4-1/2" and 5 x 4-3/4" * Backspacing:4 -1/4" Offset: -6mm * This is a dual bolt pattern wheel to accomodate two different bolt patterns meaning it is a universal fit wheel with 10 bolt holes. Click here to learn how to measure Wheel Backspacing, Wheel Offset or Bolt Pattern. Note: Shipped overweight. The style of the Cragar Street Pro is reminiscent of the Halibrand Sprint which was made famous on the circle track cars of the 60's. The similarities stop there, however. 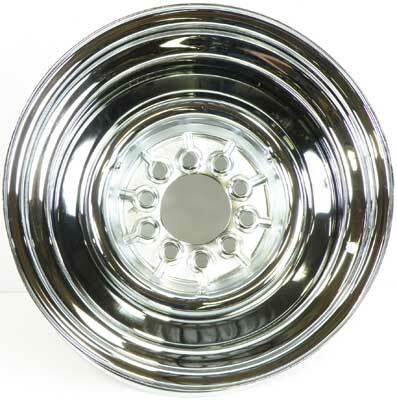 Unlike the Halibrand which was made of magnesium and required constant polishing to retain its shine, the Cragar Street Pro is a chrome plated steel rim with a chrome plated aluminum center. It cleans up easily and retains its shine with a simple hosing off and wiping down. The price of original 60's era Halib rands has been pushed up by collectors and the new Halibrand wheels are also very pricey. So, if you'd like the look of a legend at about 1/4 of the price, the Cragar Street Pro 390 is definitely the way to go. 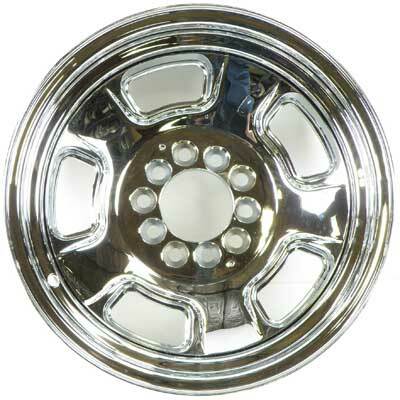 A chrome aluminum spinner style ce nter cap is included with each wheel. Lug nuts sold separately. Sold individually. Specifications: Wheel size: 17" x 8" Bolt pattern: 5 x 4-1/2" and 5 x 4-3/4" * Backspacing:3 -1/2" Offset: -25mm * This is a dual bolt pattern wheel to accomodate two different bolt patterns meaning it is a universal fit wheel with 10 bolt holes. Click here to learn how to measure Wheel Backspacing, Wheel Offset or Bolt Pattern. Note: Shipped overweight.